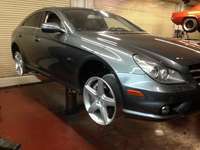 We fix curb rash and wheel well restoration too! Do you have major curb rash? 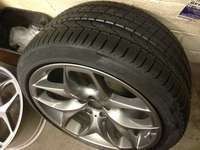 Let our trained technicians restore your factory wheels to their showroom condition. Save $$$'s today and repair, not replace, your wheels! We can repair and refinish your factory painted wheels today. 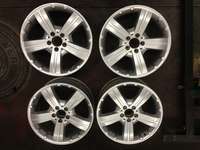 We specialize in cosmetic repair and refinishing for all makes / models with factory painted alloy wheels. Our expert technicians can repair and restore your o.e.m. factory wheels to like new condition at a fraction of the dealer replacement cost. We guarantee all of our customers a professional, fast and very affordable solution to your o.e.m. 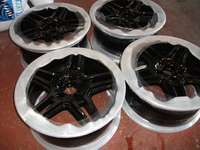 factory wheel repair and refinishing needs. What is o.e.m. wheel repair and restoration? 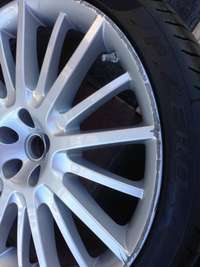 We remove and repair the cosmetic damage on the face as well as the lip of your factory painted wheels. What types of wheels do we repair? We specialize in factory painted o.e.m. 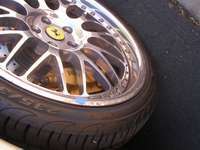 wheels and can also repair most other wheels that have been damaged. We will need to inspect all wheels prior to determining the exact cost and time frame for wheel repair and restoration to be completed. How do we repair and restore your o.e.m. wheels? 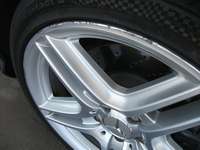 We grind out and sand down the cosmetic damage to your factory wheels. We then prep and refinish the surface of the wheels to a brilliant factory finish. 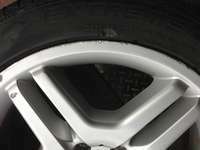 Why do some advertisements offer rim repair and others offer wheel repair? There is a simple answer to this question. Rims are on bicycles and wheels are on vehicles! 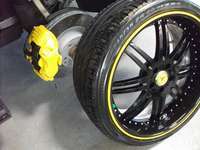 Let us pamper your vehicle wheels with the finest care and restoration it deserves. Inner wheel well restoration available to make your new wheels & tires look their very best! If you choose to have your vehicle updated and make your new wheels and tires stand out from the rest. The Car Guys of Scottsdale can make that happen with our inner wheel well restoration services. Stop by and see what a difference it makes and get your free estimate! Based at the Scottsdale Airpark we also serve all of Phoenix, AZ and surrounding valley communities so call 602.524.0807 or contact us for wheel repair and refinishing, we fix curb rash too. Serving Scottsdale, Phoenix, North Scottsdale, Tempe, North Phoenix, Cave Creek, Carefree, Paradise Valley, Fountain Hills, Arizona with wheel repair and refinishing, we fix curb rash too!